I swung by GC during my lunch break, and was greeted by a friendly tech who's an offset/shortscale geek... and offered to buy it from me. He confessed to me that he took it apart, took pictures, and either plans on building a similar guitar or modding the next used Jagmaster that shows up at the store. He says that the work was well done when it was first done, and that whoever did it likely spent more money on the mods than on the guitar. Anyway, he injected glue and resoldered it. It sounded very nice (in fact, nicer than before), but the pots were still scratchy, so he told me he'll swap them out and have them ready go to before he leaves for the day. So after work, back to GC to pick it up. And it's back, and it's sounding and feeling a lot better. The first thing I did when I got it home - put a mustang bridge on it, so now the strings stay where they need to be. Made for Fender instruments in a variety of vintage and contemporary models. 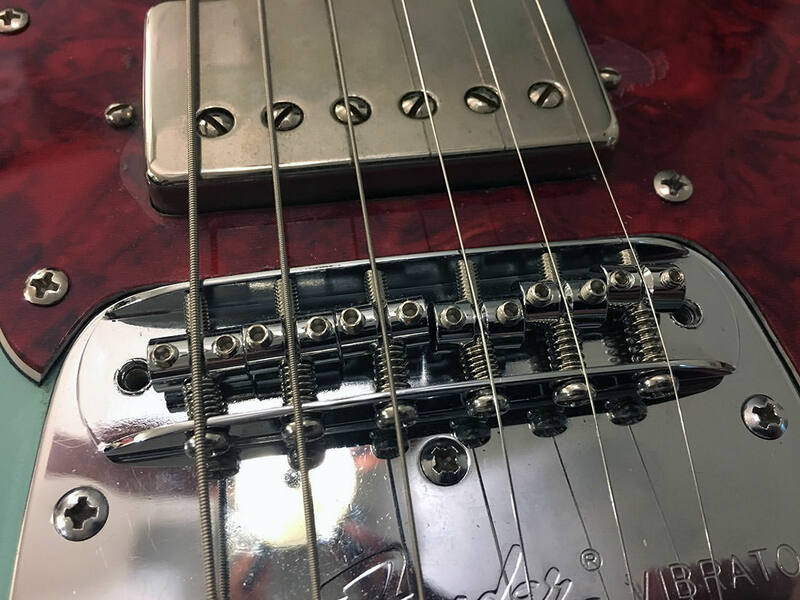 Chrome-plated bridge assembly includes six fully adjustable saddles, six intonation screws and springs, and two mounting posts with adjustable allen screws. Used on the Kurt Cobain Mustang and Squier Vintage Modified Mustang. Has smaller barrel saddles than the standard Mustang bridge. Which guitar center location was this? It was bought originally from the GC in Evansville, IN. The work was done locally at the GC in South Miami, FL. Was it the one in Kendall? That used to be my go to store. Was it the one Kendall? That used to be my go to store. Yep - that's the one. I live next to downtown, so it's the closest one when traffic's not horrible. When traffic's bad, getting to Hallandale can be faster, since I can take the 95 express lanes and be there in 20 minutes. it looks decent, definitely an improvement on the ones used previously on Mustangs. I have original 70s Mustang 7.25" ones on my '72 Mustang and '66 Jaguar and they're decent, but the more modern one I had one my '65 RI Mustang wasn't great. Buzzy and strings slipped. My Squier Jaguar has a straytrem one on it with matched 9.5" radius and that's also very nice but expensive.